Publishing Fine Poetry Since 1971. The Poet’s Press, one of the longest-running independent poetry presses in the United States, has a distinct leaning toward powerful, neo-Romantic writing with clear meanings, powerful emotions and humanistic values. In other words, poetry worth reading! The Poet's Press also operates two additional imprints. 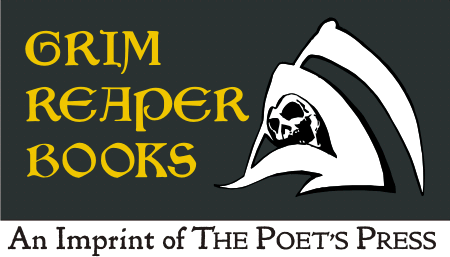 Grim Reaper Books specializes in the Gothic and supernatural. Yogh & Thorn Press specializes in scholarly books and reprints of rare and wonderful "lost" texts. The Poet's Press was founded by Brett Rutherford in 1971 in New York City, and has now published 239 titles. The press was based in Weehawken, New Jersey and in Providence, Rhode Island from 1985 to 2015, moving to Pittsburgh, Pennsylvania in mid-2015. The reading list from our archives includes full text and/or excerpts from some books which are still currently available in print. Other books which are out of print are presented here to help promulgate the work of these important poets. You may read these texts for your enjoyment, or even save the HTML or Acrobat files and print out poems. But please respect the copyrights of the authors and do not republish, perform or otherwise use the non-public-domain texts without our knowledge. A large part of our energies are also devoted to preserving and promulgating no-longer-living Poet's Press authors, most notably Emilie Glen, Barbara A. Holland, Jack Veasey, and Annette Hayn. Contributions to the archives for these poets are welcome, in the form of undocumented poems, photographs, and personal reminiscences. For ink-on-paper books, we use Amazon's Kindle Direct Publishing for printing and fulfillment. Like many other small presses, we use on-demand services as a commercial printer and distribution operation, retaining our own identity, catalog, and ISBN number. Many of our titles have been available in UK and Europe since 2012. Most current Poet's Press editions are available for purchase as PDF ebooks, all priced under $5. The catalog web-page has "Buy Now" buttons for instant ordering and download, payable via credit card or PayPal. We expect to begin issuing some titles as "ebook only" in 2018. We do not currently publish books in epub format, preferring the Adobe PDF format, which preserves the typography, layout, color and design of our printed books. An epub format for our books will be developed in late 2019. We have also added interesting and important public domain texts and PDFs to the website, such as the pages on Greek and Latin Poetry. We are searching for the best available public domain texts for major poets, and will add more as we find them. The Poet's Press is not a vanity publisher and we do not charge authors to have their books published. We select poets and titles that we believe fit our mission. Since our founding in 1971 we have produced books in many ways: as hand-bound chapbooks, as commercially printed books, as on-line e-books, and, most recently, back into print using on-demand printing. 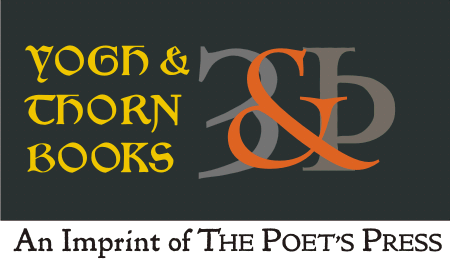 The Poet's Press and Yogh & Thorn books are currently not accepting poetry manuscript submissions from individual poets. Poets are just as well-off publishing their own chapbooks. We welcome collaborations and joint-publishing projects with other small presses, and with editors and scholars who have press-ready manuscripts in our areas of interest, including anthologies and annotated editions of poetry.